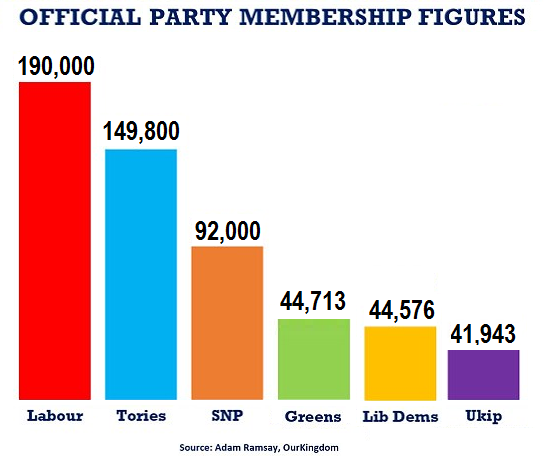 A lot of the press yesterday got excited about the fact that the Greens are about to surpass UKIP in membership numbers. At this rate of growth, The Greens will also have surpassed the Lib Dems in just a few days too. Which means there’s no excuse to exclude the Green Party’s leader Natalie Bennett from the leadership debates. Back in the 1960’s and ’70s it was feared that the NF would surpass the Liberals to become Britain’s third party. Now Tom Pride shows us that it’s the Greens, who seem to owe much of their success to the perception amongst many that they fill the void in left-wing politics formed by the creation of New Labour under Blair. Blair’s true colours are shown by the fact that, according to yesterday’s Independent, he has been asked to speak at this year Republican Party summer retreat. However, whether the Greens really are a left-wing party, or merely have a left-wing façade or veneer to appeal to alienated working class voters, is a moot point. Either way, they’re still a better alternative than UKIP, the Liberals and most definitely far better than the odious NF or BNP. I agree, Greens should have a voice. Of course by the membership measure SNP cannot be ignored either. They currently have twice as many MPs as Green and UKIP combined so should be included for that reason also. Current polling suggests they will take most of Labour’s seats in Scotland and so may form part of the next government. Can anyone justify excluding them? In this respect Party membership figures could be said to have no significance but what they do reveal is more significant. They reveal the harsh truth of British politics although the nature of that truth is open to different viewpoints. also taken into consideration the enthusiasm for the single issue referendum in Scotland and the potential future use of referendum and the use of digital technology for voting in all kinds of situation as long as steps can be taken to prevent China, Russia Isis and the CIA using their technology to fix the outcome. Interestingly I have just completed a survey of political party’s policies, you do not know until the end of the survey which party’s policies you agree with most, it is also not obvious by the policies which party is which, although the Tories are not difficult to spot. I came out nearly 80% green and 20% labour. At the last General Election, the Green Party stood in fewer than half the constituencies and achieved one per cent of the vote. Under the circumstances getting an MP elected was impressive. Surely they are likely to do better on 2015? The YouGov poll published yesterday had them on five per cent. The Populus Poll yesterday had them on four per cent. Often they poll a bit higher – six or seven per cent. What may not be understood by all their supporters is that the Green Party is on the extreme left. Those refugees from Michael Foot’s Labour Party circa 1983 would (and sometimes do) find themselves at home there. They can sing the old tunes. Higher tax, renationalisation, smash capitalism, no to NATO – all the predictable themes. The image the Green Party enjoy is of an eccentric but well meaning outfit – that means that they tend to get a soft ride in the media. It has meant that some Liberal Democrats, wishing to indulge in an anti establishment gesture, switched to the Green Party rather than Labour. The reality remains that the Greens are not so cuddly but often prove to be an unpleasant, intolerant party. The Green Party have just been holding their annual conference in Birmingham. In her speech their Party leader Natalie Bennett claimed that Party membership had risen by 28 per cent in the past year and that the Party would contest “at least” 75 per cent of constituencies in the General Election next year. to the West Country’s tally of Green parliamentarians with Darren Hall. Some of these seats are Labour/Lib Dem marginals – it is difficult to predict what impact an increased vote for the Green Party might have. Perhaps the Greens will take a similar number of votes from Labour and the Lib Dems and thus see their significance neutralised. But there could well be a handful of Labour-held seats where the Green Party represent a serious threat. That could prompt a diversion of money and manpower by Labour from campaigning in seats they need to gain. It puts them on the defensive. More generally the Greens offer an impediment to Labour in seeking to hoover up all the votes of disaffected Lib Dems. Politics is becoming more fragmented on the Left as well as the Right. What if half a dozen Green MPs and that they would be needed by Mr Milband as coalition partners? Mr Miliband should be challenged to rule any deal with such an outfit – it would be as bad as making George Galloway a cabinet minister. The amazing thing isn’t that membership of the minor parties is so high, it’s that Labour and the Tories are so low! I am not surprised that that comment emanated from Conservative home, clearly when there is no longer a left wing voice in parliament, like minded people will migrate to the most likely party that meets most of their beliefs. We only have right wing views expressed in parliament and we desperately need an effective opposition, New Labour are promising more austerity and yet condemn the Tories for carrying out exactly that, they also pretend that they will save the NHS whilst keeping the tendering process in place, so that privatisation can continue unabated. People have been told for over forty years now that balancing the books is prudent, but history tells us that austerity in the middle of depression is a very dangerous idea, Ed Miliband understands that only too well but still proceeds along the path that has led us to where we are today. The Neo-Liberal agenda is obvious, austerity leads to the need for more austerity, it’s self fulfilling prophecy is that more cuts make public services ripe for privatisation. New Labour have chosen to be the party that is friendly to private business when it should be obvious that it is the private sector that is failing; because it relies on buoyant government spending to create it’s profits, it also can’t or won’t pay real wages that keep the economy going. At least the Greens have a perspective that most of us can relate to. The Green support LVT and basic income which can be used to cut harmful taxes. Vote green! taxing income or buildings/improvements discourages work or building. Remove harmful taxes, should appeal to conservatives. Dead weight loss removal should lead to strong growth. 2. Can’t be avoided, unlike income/capital taxes. 3. The value created by the right to exclude others from land is a govt monopoly. All land values created by the community – location, property rights, schools/hospitals, low crime, etc. It is not really a tax, payment for benefits received. Most taxes are basically theft, and we justify with “othering”and “they deserved it”,e.g. the 99% vs 1% movement. Also the bible says land is the property of all mankind. 4. Govt already decides who owns each piece of land. LVT needs no IRS/HMRC Agency with vast powers. 5. Would discourage hoarding of land. Use it or sell it! Reduces urban sprawl. 6. Prevents property bubbles and acts as quasi-bank regulation as most loans secured on land. 7. Every land title deed soaking in blood. LVT corrects unnatural inequalities caused by govt power. Land ownership is very skewed. 8. Works in practise. For example the city of Atloona, Pennsylvania has seen large declines in numbers of vacant buildings since introduction. 9. Perfect tax for MMT Advocates, helps ground the currency. No forceful coercion and based on libertarian values. Support LVT now! It has no distortion, impossible to avoid and is a brilliant idea. The Green Party support this but we need a left-right movement from across the spectrum.